Campbell Hall's 6-foot-4 junior guard, ranked as No. 2 basketball prospect in nation, will decide later this summer. His brother, Justin, signed with Huskies in November. Washington, his mother, Toya, said Thursday. He will be taking an unofficial visit to Washington on June 10.
contact Bruins Coach Ben Howland to arrange one. announced Monday that he had committed to UCLA. Holiday is expected to announce his decision later this summer. If we could get Holiday, that would be an amazing recruiting class. If Collison has another year as good as this one he is gone so will have another scholarship available. The only problem will have is finding minutes for everyone which is a good problem to have. Listen up Holiday, you know you want to play in Westwood. Not only can your family and buddies watch you play, you can go to the NCAA championship game (as a participant)! We will allow you to park on campus. I have handicapped stickers for you too (joking). It's a no-brainer. Wet, rainy, cold Washington where your brother is or you can make a name for yourself and be the man in Westwood. Think long term buddy. Hollywood agents come to the games and I know commercials are in your future. All signs point to Jrue going to Washington though. Almost everyone is reporting it as well. Supposedly, the Holdiday's weren't happy with UCLA's lack of recruitment of Justin. Oh well, Jerime can fill the role well. If we want another guard, we should offer Larry again. If not, Breshers is still interested. What is your source for the above comment??? I have not heard that at all. I've read in one of the articles on this site that Jrue said he and his brother were not a package deal which would lead me to believe that the door is open. There are also signs that UCLA will be more competitive in the national spotlight which might also impact on the decision. All speculation at this point but my guess is UCLA is the front runner. 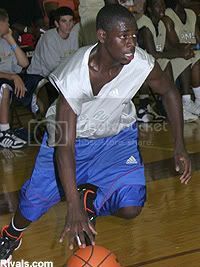 If Jrue is better than his brother, he'll be a Bruin! Jrue went out of his way to make clear that him and his brothe were not a package deal. Justin wasn't recruited by ucla because they had 2 scholarships to give, one going to Love. there is no basis for expecting Washington to be the front runner. Jrue should go to washington man. come on Jrue you are amazing and you and your brother will have a blast. People say its all cold and rainy but its actually awesome, and a beautiful place. you could put the uw program on the top, and start a dynasty there. Has anyone considered the fact that Jrue would probably steal playing time from his brother if he followed him to Washington ? I'm sure they've tried to convince him this wouldn't happen, but it's a good possibility. Justin and Jrue's game is not that different except that Jrue is a better, faster version. Justin will be struggling to get his playing time anyways with the great talent Romar has been bringing to UW lately. I think the Holidays must know this, which is why I think ultimately Jrue will be a Bruin. Let's simply compare the schools...UCLA has ben to the final four two years in a row and looks to return with the current crop of recruitments. Washington is just struggling to maintain in the middle of the pack in the Pac Ten. Coach Howland is now being recognized as the coach to "go thru" to become a better defensive player and improve your NBA stock...hands down, Jrue wants ALL this in his future...Oh yeah, and let's go ahead and throw the weather in for good measure...CASE CLOSED! What do the Huskies have to offer?? ?They are losing Hawes and they couldnt make the NIT last year. The PAC is so strong they are going to have serious problems for years to come. It will be a tough pick for Jrue. First of all UCLA is not just a good basketball school its also good for acdemics and there is good weather here. Since Justin is going to UW Campbell Hall point gurd, Robert Ford is trying to be a walkon player @ UW so they can play together. So if Jrue goes to UW they may have 3 guys who played together like they did for 2 state titles. They will know each other better and know each others styles of play and may be the best trio of friends to play in the NCAA. Ballboys personal percentage of the two universitys for Jrue. UW 51 percent UCLA 49 percent. Im a 4th grader at Campbell Hall and Ive watched him for a long time. yo man i think dat jrue should go with his brother because i think both of them put together is a monster squad. inplus i never played on the same skool team as my brother and im a year older dan him. so i think dats kool dat he can play wit his brother. from maruqell norfolk va. age 15.